The 57th anniversary of National Poison Prevention Week is March 17-23, 2019, marking five+ decades of safer homes and saved lives. While much of the nationally-recognized effort has been directed at raising awareness with parents of small children, the veterinarians at Pet Poison Helpline remind us that pets are also vulnerable and susceptible to accidental ingestion of potentially life-threatening common items in the home. In conjunction with National Poison Prevention Week, Pet Poison Helpline has simplified the process of identifying potentially poisonous situations by categorizing them by room or area in which they reside. “It is our hope that by presenting the information in this manner, pet owners can easily go through their home and eliminate situations that could result in a very sick pet,” said Brutlag. During National Poison Prevention Week the Pet Poison Helpline suggests protecting your pets by poison-proofing your home, room by room, as follows. Learn about your plants, since some common household plants can be toxic to dogs and cats. For example, lilies (Lilium and Hemerocallis spp.) are especially poisonous to cats, so should be eliminated from bouquets where cats live. Just one or two petals can be fatal! For information on other dangerous household plants, be sure to view our list of top 10 plants poisonous to dogs and cats. Keep ashtrays and smoking cessation products such as nicotine chewing gum or patches out of reach. Even cigarette butts contain enough nicotine to cause poisoning in pets. Be aware of human foods that are poisonous to dogs and cats. Watch out for raisins, grapes, macadamia nuts, onions, garlic, unbaked yeast bread dough, fatty foods and chocolate. Make sure to view the Pet Poison Helpline’s website to learn about other surprising human foods that are toxic to pets. Always check the container before giving medication to your pet to make sure it’s the correct medication. Also, it is best to store your own medications separately from pet medications. Pet Poison Helpline receives many calls from people who accidentally gave their own medication to a pet. Keep rodenticides (rat and mouse poison) far away from pets and be mindful that rodents can transfer the products to locations accessible by pets. If you need to use rodenticides in your home, consult your veterinarian or Pet Poison Helpline in order to select one that is safest for your pet. Keep glues out of reach. Some glues, such as Gorilla Glue®, expand greatly once ingested and require surgical removal. Just one ounce of glue may expand to the size of a basketball, as illustrated in the side-by-side image below. To avoid this situation, be sure to keep glues out of the reach of pets. Grub or snail killers—especially those that include metaldehyde—can be harmful to pets. Avoid using them if possible. If you think your pet may have ingested something harmful, take action immediately. Contact your veterinarian or Pet Poison Helpline at 1-800-213-6680. Pet Poison Helpline is the most cost-effective animal poison control center in North America charging only $39 per call; this includes unlimited follow-up consultations. Pet Poison Helpline just released a native app, or a mobile friendly version of its website. If you have a smart phone, be sure to add Pet Poison Helpline’s native app to your home screen for pet safety tips and information at your fingertips. 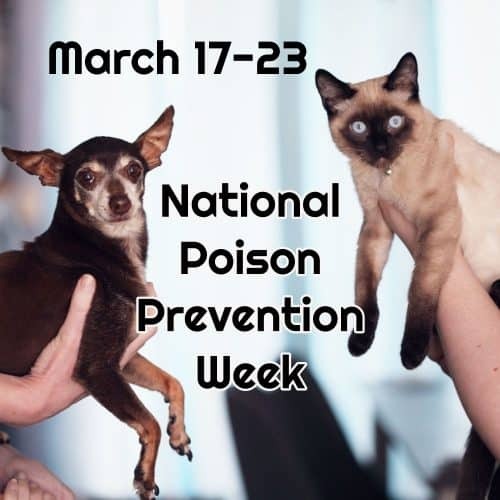 Full Circle Vets would just like you to keep in mind during National Poison Prevention Week that many household cleaning agents, some plants and a variety of foods can be toxic to your pets. To be a pre-emptive pet parent, you have to be aware of those things that may cause your pet problems. Keep the number for the Pet Poison Helpline on your fridge in the event of an after hours incident. Know where your closest vet is and where the after hours vet emergency facilities are. It is much less stressful to know what to do when an unexpected emergency happens, than to be in a panic. While we at FCVC are always happy to answer questions and solve problems when we can – if the problem escalates quickly after hours, you need to know where to turn. We are happy to help you fill in the blanks for your pet emergency plan. Related articles you may find interesting – The Gum You Chew May Poison Your Dog, Pet Dogs Die After Eating Toxic Mushrooms in Own Yard, and Family and Pets versus Rodents and Rodenticide Use.